Today I’m thinking about spring dresses because Easter is just around the corner. With only a few weeks until it’s here, now is the time to start planning if you haven’t already. I’m here to stir your imagination with some ready-to-wear examples for spring dresses as well as one skirt thrown into the mix. I’ve rounded up quite a few ideas that are brimming with inspiration so you can sew-it-yourself with Oliver + S. I hope you enjoy this post as much as I enjoyed searching for these beauties! 1) Do you have a special occasion on the calendar? Dress her up in something similar to this pretty dress. Recreate the look by turning the Butterfly Blouse into a dress. Or try lengthening the School Bus T-shirt into a dress and add lace flutter sleeves. 2) Stitch a dress like this that she’s sure to love. Sew a Library Dress for a similar look. We also have a tutorial on using a knit fabric for the Library Dress. 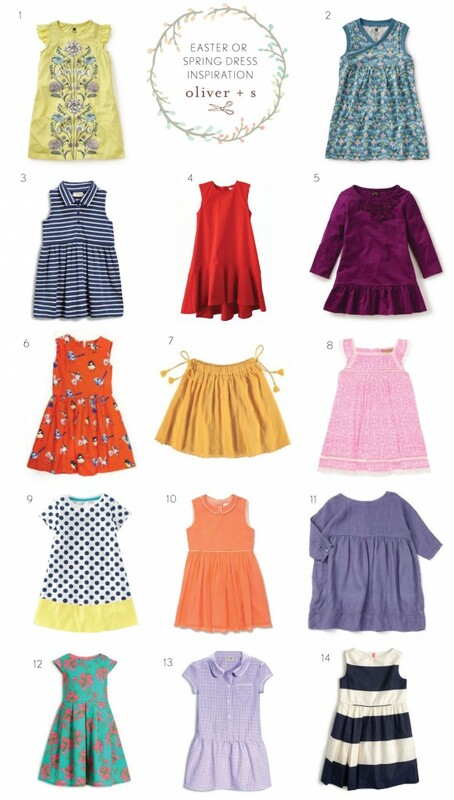 Or maybe try the Hopscotch Dress pattern? 3) For something a little bit more casual and definitely comfortable, turn the Parachute Polo into a dress. 4) When you gather and celebrate, keep her stylish. Maybe try the Pinwheel Dress pattern for this one? 5) Here’s a fun one and purple is such a classic springtime color. Try turning the School Bus T-shirt into a ruffle skirt dress. 6) Most people can’t wait for spring to arrive; warmer weather brings us many of our favorite things: birds! She’ll rock the frock in a sleeveless collarless Fairy Tale Dress in printed bird fabric. 7) How about a skirt instead? Give her twirl power with a springy yellow colored Swingset Skirt. Put drawstrings on both sides of the skirt and how about some tassels at the ends of the drawstrings too? 8) Pink is a classic spring dress color and this dress is so soft and girly. She’ll be pretty in pink in a Garden Party Dress. 9) Talk about a dress with fresh style! Have fun mixing a print with a solid to create a color blocked Carousel Dress. 10) When you’re getting her dressed for a special occasion how about this bright, eye-catching one? Add piping on the collar and around the waist of a sleeveless Fairy Tale Dress. 11) Here is a lovely lavender linen dress. Recreate it with the Playtime Dress, of course! 12) Using the box pleats tutorial, sew a pretty floral Fairy Tale Dress and pair it with an Easter hat or bonnet. This outfit will be perfect for visiting the Easter Bunny, an Easter egg hunt, or Easter brunch at church. 13) Your little girl will be ready for every springtime party in this. The Jump Rope Dress should do the trick. Wanting to sew with gingham this spring? Check out our Gingham Inspiration post. 14) For this look, take the Fairy Tale Dress pattern, use the 10 stripes Fairy Tale Dress tutorial, add some pleats to just one side, and she’ll be a frock star! For little girls, size 4 and under, don’t forget about matching Seashore Bloomers under the dresses, wouldn’t that be darling? And in case that wasn’t enough of a fix for you, here’s the Spring Dress Inspiration post from last year and another post all about floral dresses. I’m certainly feeling inspired and I hope you are too. Love your ideas and inspired to make several dresses for my granddaughters. Could you suggest some fabric lines for the knits and cottons that would work well with your patterns? Thanks so much. Where are the boy Easter outfit ideas? The Art Museum pattern make a great Easter outfit for boys. But, frankly, there aren’t enough people interested in sewing for boys to feature boy patterns in these inspiration posts. We wish this were different. We say it all the time; our boy patterns never sell enough copies to justify producing them. But we keep doing it to support the small number of people who do sew for boys. So if you want boy patterns please buy the ones we produce and encourage others as well. It’s the sales numbers that help us decide what to make and what to feature on the blog. The Sketchbook or Art Museum Patterns would make a very dapper fancy outfit for a boy for almost any occasion! I think with boys, the patterns and shapes don’t vary so much, but fabric is everything! Maybe an inspiration blog post using boy clothes would help to sell some of the boy patterns? There are many fab photos in the Flickr pool that could be used. Thank you for all these lovely ideas! 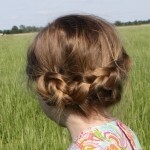 I like finding new inspiration for my girls wardrobe so the links are all appreciated. One thing I love about being able to recreate a look is when you find out how much these things cost in the shops versus being able to sew them yourself. Like the price of dress number 6, yikes! I agree on the boy patterns, I sew the Sketchbook and Art Museum patterns all the time. My boys’ favorite patterns! I juts made three sets up for Easter even.